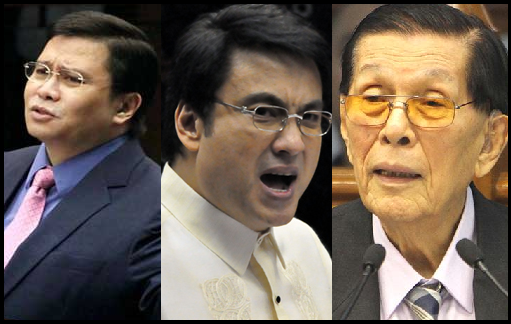 April 2, 2014; Senators Juan Ponce Enrile, Ramon Revilla Jr., and Jinggoy Estrada were found to have accumulated P172 million, P183 million, and P242 million, respectively, from illegal kickbacks with the projects turning out to be ghost projects according to the Ombudsman. This plunder case for the thee senators is related with Pork Barrel Scam involving the use of huge sums of money from the Philippines' Priority Development Assistance Fund (PDAF) or by called dummy NGOs for purported "ghost" projects. Ombudsman Conchita Carpio Morales signed three separate joint resolutions related to found probable cause of plunder and graft charges to the three senators last April 1. According to ABS-CBN news, the three senators will face arrest and detention if the Ombudsman rejects their appeal, motion of reconsideration, that should be submitted within 5days. The said Plunder case is non-bailable if the evidence is strong and may resulted to suspension from the Senate office of the three personalities mentioned above. Pork Barrel Scam is known to be the biggest corruption scandals in the country's history that involves about 10 Billion pesos which is only 5% of P200 billion loses of Philippines per year due to corruption. Philippines is the most corrupt country in Asia according to Bloomberg in year 2013 with score 9.40/10. It was said on the news that spite of being Top 1 corrupt country in Asia, PH improved its image in relation with Transparency and moving up from 105th to 94th rank in Transparency International Index over 177 countries under Aquino administration. People of the Philippines is watching over to this biggest corruption scandal (Pork Barrel Scam) of the history and hoping to get satisfied with possible result of investigation. Let your opinion be heard, speak up your mind by posting comment below, thanks.